SOUL MATES | Gurly's collection of quotes, notes & video's made by great people who have been sharing their enlightenment through their words and actions. 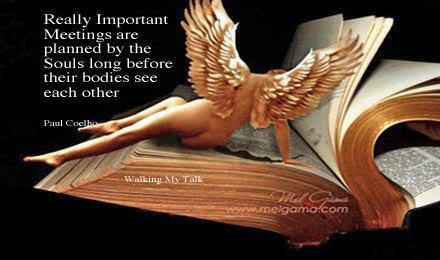 We as Souls plan to meet up with family members and other soul mates when we return. Most of what we have learnt here on our many lives, has learnt while walking with these same Souls, and as we evolve further each time, we can help to guide them.. This entry was posted in Life, Quotes, Self development and tagged Paulo Coelho, Quotes, Reincarnation, soul, Soul mates, Spiritual by Gurly Hafsmoe. Bookmark the permalink.